One has recurring nightmares. Another can't take a bath anymore. Still another can't sleep. 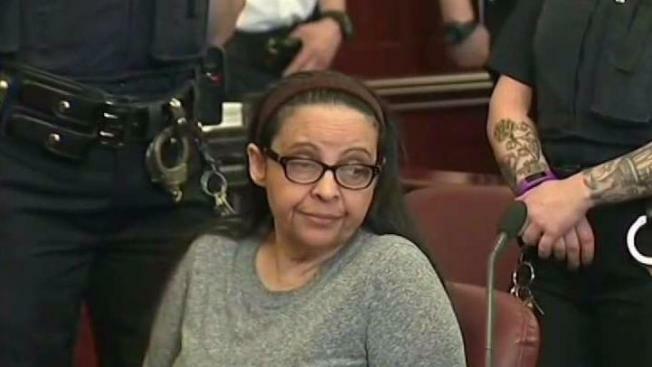 Jurors in the murder trial of a nanny who stabbed two small children to death in the bathtub of their Manhattan apartment said the nearly two-month-long experience took an emotional toll they fear will linger long after their guilty verdict. They are still haunted by the words of the anguished parents and the grisly photos that showed 6-year-old Lucia Krim and her 2-year-old brother Leo gashed so severely in the throat that they were nearly decapitated. "It was gut-wrenching," said juror David Curtis, a 52-year-old actor who has raised two children of his own. "I had nightmares which related to losing something important to me or not being able to find my family. It truly did affect me." Alternate juror Chloe Beck, 31, said her days of taking baths to unwind ended after seeing the crime-scene photos (not shown to the courtroom spectators) that showed blood coating virtually every surface of the bathroom. There was even a bloody children's toothbrush. She fixated on the toddler, Leo, calling him her "little guy." "I don't know how I'll ever get over this," she said, tears streaming down her face. For juror Edgardo Chacon, 57, it's the face of the girl, Lucia, known as Lulu, that he sees when he sits up in the night. Many of the more than 30 stab wounds on her body indicated she tried to fight back. "I was there for 33 days, and every night I think about Lulu," he said. "I don't know why it was in my mind. But it was not fair. ... It's not fair what she did to those kids." Yoselyn Oretga was convicted Wednesday of murder after the jury rejected the argument that she should not be held responsible in the October 2012 slayings because she was too mentally ill. Prosecutors argued that Ortega, who had been the children's nanny for two years, knew exactly what she was doing, acting out of jealous hatred of the children's mother for her wealth and happiness. Among the most wrenching moments of the trial came when mother Marina Krim took the stand as the first witness, telling of coming home from a swimming class with her 3-year-old daughter, Nessie, to discover her other two children dead. She described how she saw their vacant eyes and their small bodies ripped apart, and just started screaming. "It was a scream you can't imagine is even inside of you," she testified. "I don't even know where it came from. I just thought: 'I'm never going to be able to talk to them ever again. They are dead. I just saw my kids dead.'" Several in the panel of 12 jurors and five alternates who sat through the trial were parents, and for at least one, the testimony early in the trial was too much. The man with two small children of his own — ages 2 and 4 — asked the judge to be excused, saying he could no longer be impartial. Said juror Curtis: "I worked very hard at not thinking about my own children. ... It is horrifying to think of being in a position, of having to experience or go through the process of what the Krims had to go through." About 70 percent of jurors report some level of stress, but less than 10 percent report extreme stress, according to a study done by the National Center for State Courts. Some judges will request a crisis-management session after a trial but that's unusual and was not ordered after the nanny verdict. "Juror stress is a problem more common than we realize, but cases where there is a mental health intervention are rare," said Theodore Feldmann, a professor emeritus in psychiatry at the University of Louisville who has counseled jurors after difficult trials, including those who convicted serial killer Jeffrey Dahmer in the 1990s. Feldmann said jurors may experience what's called acute stress disorder, essentially a less-serious form of post-traumatic stress disorder that includes such symptoms as headaches, anxiety, difficulty sleeping, nightmares and depression. At the Ortega trial, even jurors who weren't deeply disturbed were still highly emotional. Alternate Brittany Yee, 27, was dismissed but stayed and waited for the trial to end. She said she was upset by the evidence she saw, but that she was handling it all right. But then father Kevin Krim entered the courtroom and sat down next to her. When the verdict was read, she sobbed and held his hand. Krim later thanked the jury in a statement he posted on Facebeook. "These jurors went through hell," Krim wrote. "I hugged every one of them I could."